The holiday season is upon us and the Avis house could not be more excited. We are Christmas junkies! Who’s with us?! Does anyone else remember a time, not too long ago, when we did not even begin to think about Christmas until after Thanksgiving? Radio stations and stores waited until then to play music and retailers would hold off on Christmas merchandise until Black Friday at least. Now all things Christmas start so much earlier. And I’m not even mad about it. I say, bring on the holiday cheer as early as possible! One reason I love starting the season earlier is because every year I feel as though I scramble to get all the fun, festive things checked off my holiday bucket list. When we start earlier it gives me that many more days to squeeze all the holiday festivities and traditions in. One thing I love to do during the holiday season is bake cookies. But you want to know one thing that always feels stressful and rushed? You guessed it: baking cooking. Here’s the thing, the kids always want to be involved, and I want them to be…I really do. But it’s so much better in theory. The truth is, when I’m signed up to bring two dozen cookies to my son’s class and another two dozen to a Christmas party, enlisting the kids to help turns into whole bowls of flour dumped on the floor and sticky fingers going from their mouth to the batter contaminating the whole thing making our cookie time together counterproductive. There is a time for baking with the children, and I am looking forward to that, but if I want to make four dozen beautiful cookies void of my children’s germs, then I prefer to do it alone. This year, I made a brilliant plan and did a whole morning of baking AFTER I sent the kids to school. It was glorious! I turned on Christmas music along with the oven and got to work. I recently got a few bags of CRUNCH Dark Jingles and I’m obsessed. These candies are basically a Crunch bar shaped like a bell…dark chocolate and crisped rice dreams coming true. They are delicious, and I keep a candy dish around the house because their colorful foils are so festive! So the other day I was eating one of these festive Crunch bell-shaped dark chocolates and thought, “These would be perfect in a cookie!” And that is exactly what I did. I literally put one of these in a snowball cookie and our lives are now complete! 1. Heat oven to 375*F.
2. Cream together the butter, 3/4 cup of the powdered sugar, and the salt until fluffy; blend in the vanilla. 3. Gradually beat in the flour, blending just until combined. 4. Shape dough into 1 1/4" balls. 6. place 1" apart on ungreased cookie sheets. 7. Bake 10-12 minutes, or until cookies are set and bottoms are lightly browned. 8. Sift the 1/4 cup powdered sugar over the hot cookies; cool on baking sheets 10 minutes. 9. Carefully transfer cookies to wire racks and cool completely. 10. Dust with additional powdered sugar, if desired. Store in airtight containers. You will make these, and you will thank me. They are so bomb diggity and your friends and guests will bite into them and be very impressed. You’re welcome. But this is not all that happened this morning when I kicked the kids out of the kitchen. 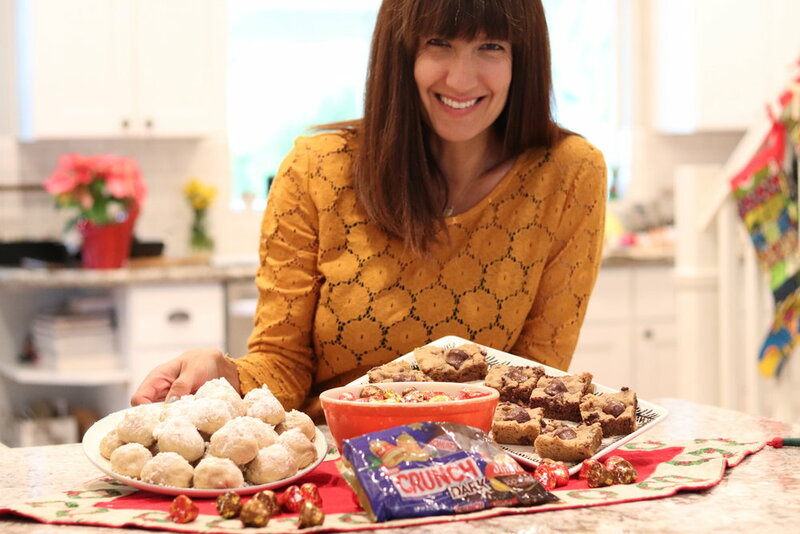 I thought, “these bell-shaped candies are so adorable they should not be hidden inside a cookie.” So, I made a second batch of baked goodness in the form of a peanut-butter blondie with CRUNCH Dark Jingle Bells…whoa! So delicious. You basically just take any recipe you have for a blondie and you stick an adorable Crunch Dark Jingle Bell on the top before you bake. Easy peasy. And that’s not all that happened this very productive, childless morning. Not it is not! As the cookies were baking, I decided to get a head start on some stocking stuffers. Every year for Christmas my husband and I are very strict about how we divide our time with our families: we do every other year with every other family. Last Christmas was with his family and this Christmas is with my family. We never travel on Christmas day and we don’t spilt our time either. But we do make a special time to celebrate with which ever family we are not spending Christmas with. So this year my husband’s family will be joning us for an early Christmas celebration. All this to say, the kids get two stocking (lucky!). So I got their stockings stuffed and ready to go for when we celebrate early with my in-laws. As you can see, these adorable Nerds Reindeer are made to hang perfectly on the outside of the kids’ stockings, making them the perfect stocking stuffer. Now, the kids are about ready to come home from school and I am feeling oh so accomplished and loving this head start I have on my holiday bucket list.